Welsh poet Steve Griffiths: scope and depth, growth and darkness, celebration. 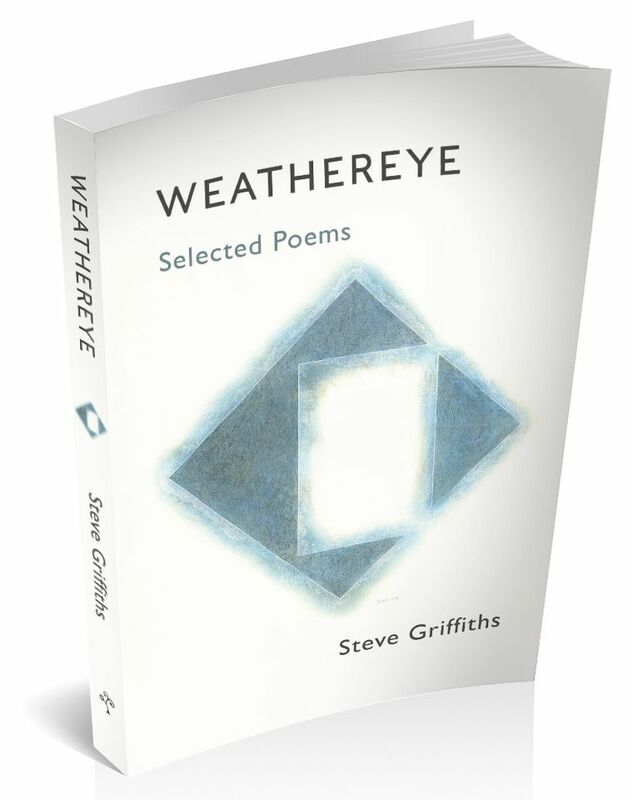 Steve Griffiths’ Weathereye: Selected Poems pulls together the best of seven collections over forty years. There are poems of childhood and family and love poems, poems of being alive and conscious – and perhaps above all a continuing quest to understand what’s going on ‘among scatterings of lived material’, exploring the nature and fragilities of community against a backdrop of the deep changes that are shaping us and challenging our beliefs. There are veins of loss, commemoration, resistance to injustice, and self-questioning; living landscape and interrogated history. Griffiths’ capacity to celebrate and lament develops and deepens as he calls increasingly on a lightness of touch and a mischievous glint. Want to read it in other formats? Weathereye is now available on a wide range of e-readers, including Kindle, Kobo, Nook and iBooks. Steve Griffiths was born in Anglesey in 1949, grew up on a beach, lived in London most of his working life, and now lives in Ludlow. He has published seven collections of poems since 1980, with Rex Collings, Seren and Cinnamon, most recently Late Love Poems (Cinnamon Press, 2016). You can see filmed performances of the Late Love Poems, for which he received Arts Council England funding, on YouTube. His work has been widely broadcast and he has read in several countries, including a series of seven readings in New York in 2012. He is one of the hundred twentieth century Welsh poets writing in English featured in The Library of Wales ‘Poetry 1900-2000’ (2007, Parthian Books). He has a collection of new poems up his sleeve. He worked first as a welfare rights and community worker, then as a researcher and policymaker in social and health inequality. Working for central Government at the turn of the century, he was an architect of a billion-pound investment in supported housing while working at weekends on his poetic exploration of a fallible Utopia, An Elusive State. He later wrote studies on reducing emergency hospital admissions. He still publishes the occasional policy thinkpiece online. And he’s a proud grandad. His poetry website is www.stevegriffithspoet.com. "This generous selection from forty years give us the measure of the scope and depth of Steve Griffiths’ work. From the start, it held the tension between the personal and the political, the view from the edge and the crunch-points of contemporary change. At the hinge of the book, we find the revelatory sidestep into the shifting, wry utopia of Al-Chwm, not an escape from but a deft critique of our realities…from where the writing returns to address the inner and the outer world with new confidence and clarity." "A varied but coherent collection by a subtle and deeply intelligent writer who can address human concerns like the intimate recall of childhood or the challenges of middle age without sentimentality; he can move between abstract thought and concrete particularities with such ease that sometimes the join is invisible. This is mature writing, picking its way through the layers and ‘surfaces’ of an experience, suddenly clarified into a single lucid image”. "Dipping through Surfaces begins with the straightforward image of the poet’s life as a stack of years, which then becomes a tree of disks – a strangely beautiful image with half-lived years that ‘glowered in the trunk’ and others just ‘a pulsing spark’ – before finally branching out into a subterranean labyrinth of tunnels, burrows, lofts, mines, attics and passages. This seems to be the loose theme of the collection: coming up to the surface from a dark place. Recovery seems to come through reverent concentration at the surface of things – in the world and in language. This brings the poet to a recognition, at the end of the collection, of the necessity of those dark, strange places, a realisation that ‘unregarded bolts of darkness / hold things together’ (‘Dark Energy’)”. Read the AI sheet for Weathereye: Selected Poems here.